Goodreads will monitor your "Want to Read" bookshelf and if it finds a deal on one of your books, it will send you an e-mail to let you know. (Login and look for "Deals" under Account Settings.) You can select which ebook retailers to monitor, so if you only want Kindle books, you can turn off all the others. You can also get deals by author or genre. Mad Ogre is giving away a free e-version of his Zombie thriller Uprising USA. I have not read the whole thing, but I am about 10% in and I can tell you it is a radical departure from your common zombie book where the survivors panic and try to make it easy to be bitten. "Ho, hum, the zombie apocalypse is here. Grab the guns and let's head over to the gun shop to pick up more ammo. We should probably round up the rest of our family, too. We can grab a sandwich and a Mountain Dew while we are out." It makes for a fun read when people aren't just running around advertising themselves as zombie bait. Maybe these characters are a little too calm and collected, but it has been a cool read so far. "The Kindle Fire is interesting because it’s the first one with a good answer: it’s much cheaper, Amazon offers a digital content ecosystem that rivals Apple’s (fewer apps, more books), and millions of people already use and enjoy Kindle hardware. The e-ink Kindles are to the Kindle Fire what the music-playing iPods were to the iPhone, and what the iPhone was to the iPad — traction in the mass market based on trust and loyalty. Amazon built an alternative to the iPad, rather than a direct competitor. It’s a different market segment. As Steve Jobs explained back in 2010 at the introduction of the original iPad, there’s unexplored territory between smartphones and laptops." 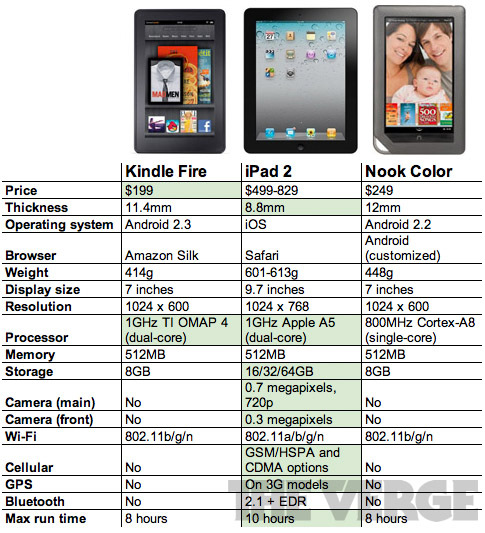 "The iPad and Kindle Fire are emblematic of their makers. Apple’s primary business is selling devices for a healthy profit, and they back that up with a side business of selling digital content for those devices. Amazon’s primary business is as a retailer, including as a retailer of digital content. They back that up with a side business of low-cost digital devices that are optimized for on-the-fly purchasing of anything and everything Amazon sells. 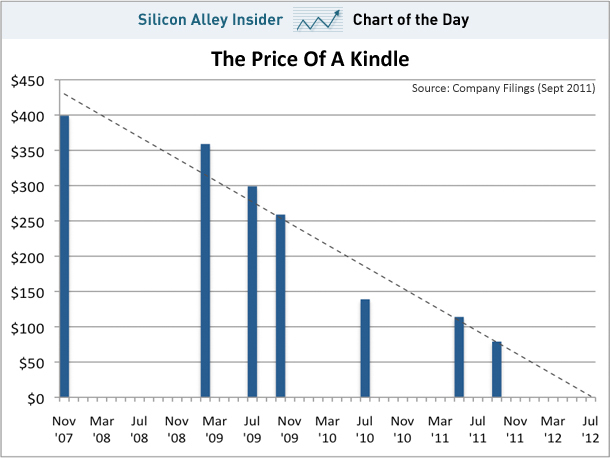 The Kindles are to Amazon what the printed catalog was to Sears a century ago." The X-Ray feature might tip the scale and give me a reason to pay a premium of an e-book. "All the new e-ink Kindles have an innovative feature called X-Ray. When you download a book on an e-ink Kindle you automatically receive a second file with information about the characters and settings of the book. The sources include Wikipedia and an Amazon-owned company book-related social service called Shelfari. It’s a welcome means to quickly figure out whether an unfamiliar character had appeared a few chapters earlier." If I buy a Kindle, I will get the version that is ad supported, because you can change your mind later and pay to opt out of the adds with no penalty. Amazon to buy Palm? Speaking of old school, maybe somebody should snap up BeOS, too. iPhone 4S... point and shoot camera killer? What is the difference between a smartphone and tablet? Very similar to my thoughts on which tablets are competitors? It depends on the use case. IT'S A KINDLE FIRE KILLER! Funny, but I disagree. The iPod Touch has a 3.5" screen. The Kindle Fire has a 7" screen. As certain demographics will tell you, size matters and that is a significant difference. It's like double or something! I just don't see them as direct competitors. I like it. Makes sense to me. So I'm all about the tablets right now... I was like a kid at Christmas watching two live blogs (here and here) yesterday as they covered the announcements from Amazon. I'd been reading all the predictions about how great this new tablet was going to be and then in the 48 hours leading up to the announcement, opinions seemed to become much more negative. The tablet was going to be a hack job and would be replaced with something different in Q1 2012. And what did we get... not only the color tablet we expected, but several new models of the Kindle - including a $79 low-end ebook reader and new touch screen models. Apple is no longer the only tablet maker that matters. And again... why SILK and the new browser model means Amazon attacks Apple... and Google! And when will the Kindle be free? Bonus Link - you aren't getting a TouchPad. Amazon Kindle Tablet Could Shake Up Tablet Wars: Here's How | PCWorld (Via Slashdot.org) - thoughts about Amazon's possible tablet and strategy - pros and cons. The 7" HP TouchPad that will never be. And the power of the iPad and other consumer devices in the enterprise - they have been leaking into our company for years and it is only getting worse, err better, err worse.